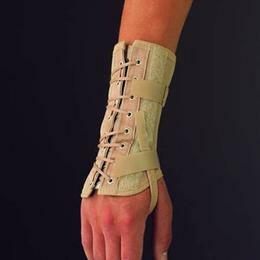 To treat carpal tunnel syndrome, rheumatoid conditions, traumatic injury, arthritis or sprains and strains. Features pull-tight lacing and touch-close binding for ease of application. Removable, malleable aluminum stay. Permits full flexion of the thumb and fingers. Breathable, elastic stretch fabric with cotton lining provides optimum comfort and support. Size by wrist circumference.Available color: Beige.